The Hudson River School was a mid-19th century American art movement embodied by a group of landscape painters whose aesthetic vision was influenced by romanticism. The paintings for which the movement is named depict the Hudson River Valley and the surrounding area, including the Catskill, Adirondack, and the White Mountains; eventually works by the second generation of artists associated with the school expanded to include other locales in New England, the Maritimes, the American West, and South America. Neither the originator of the term Hudson River School nor its first published use has been fixed with certainty. The term is thought to have originated with the New York Tribune art critic Clarence Cook or the landscape painter Homer Dodge Martin. As originally used, the term was meant disparagingly, as the work so labeled had gone out of favor after the plein-air Barbizon School had come into vogue among American patrons and collectors. Hudson River School paintings reflect three themes of America in the 19th century: discovery, exploration, and settlement. The paintings also depict the American landscape as a pastoral setting, where human beings and nature coexist peacefully. 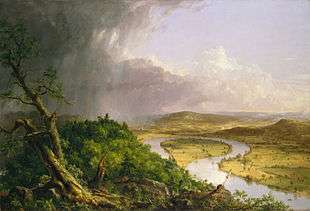 Hudson River School landscapes are characterized by their realistic, detailed, and sometimes idealized portrayal of nature, often juxtaposing peaceful agriculture and the remaining wilderness, which was fast disappearing from the Hudson Valley just as it was coming to be appreciated for its qualities of ruggedness and sublimity. In general, Hudson River School artists believed that nature in the form of the American landscape was an ineffable manifestation of God, though the artists varied in the depth of their religious conviction. They took as their inspiration such European masters as Claude Lorrain, John Constable and J. M. W. Turner. Their reverence for America's natural beauty was shared with contemporary American writers such as Henry David Thoreau and Ralph Waldo Emerson. Several painters, such as were members of the Düsseldorf school of painting, others were educated by the German Paul Weber. While the elements of the paintings were rendered realistically, many of the scenes were composed as a synthesis of multiple scenes or natural images observed by the artists. In gathering the visual data for their paintings, the artists would travel to extraordinary and extreme environments, which generally had conditions that would not permit extended painting at the site. During these expeditions, the artists recorded sketches and memories, returning to their studios to paint the finished works later. The artist Thomas Cole is generally acknowledged as the founder of the Hudson River School. Cole took a steamship up the Hudson in the autumn of 1825, the same year the Erie Canal opened, stopping first at West Point, then at Catskill landing. He hiked west high up into the eastern Catskill Mountains of New York State to paint the first landscapes of the area. The first review of his work appeared in the New York Evening Post on November 22, 1825. At that time, only the English native Cole, born in a landscape where autumnal tints were of browns and yellows, found the brilliant autumn hues of the area to be inspirational. Cole's close friend, Asher Durand, became a prominent figure in the school as well. Frederic Edwin Church, Niagara Falls, 1857, Corcoran Gallery of Art, Washington, DC. 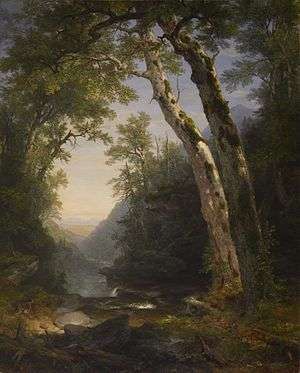 Asher Brown Durand, The Catskills, 1859, Walters Art Museum, reflects the "sublime landscape" approach employed by the Hudson River school of painting. 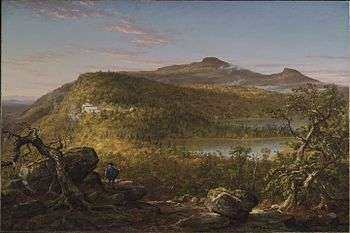 The second generation of Hudson River school artists emerged to prominence after Cole's premature death in 1848; its members included Cole's prize pupil Frederic Edwin Church, John Frederick Kensett, and Sanford Robinson Gifford. Works by artists of this second generation are often described as examples of Luminism. In addition to pursuing their art, many of the artists, including Kensett, Gifford and Church, were among the founders of the Metropolitan Museum of Art in New York City. Most of the finest works of the Hudson River school were painted between 1855 and 1875. During that time, artists such as Frederic Edwin Church and Albert Bierstadt were celebrities. They were both influenced by the Düsseldorf school of painting, and Bierstadt had studied in that city for several years. When Church exhibited paintings such as Niagara or Icebergs of the North, thousands of people lined up around the block and paid fifty cents a head to view the solitary works. The epic size of the landscapes in these paintings, unexampled in earlier American painting, reminded Americans of the vast, untamed, but magnificent wilderness areas in their country. Such works were being painted during the period of settlement of the American West, preservation of national parks, and establishment of green city parks. One of the largest collections of paintings by artists of the Hudson River School is at the Wadsworth Atheneum in Hartford, Connecticut. Some of the most notable works in the Atheneum's collection are 13 landscapes by Thomas Cole, and 11 by Hartford native Frederic Edwin Church, both of whom were personal friends of the museum's founder, Daniel Wadsworth. Thyssen-Bornemisza Museum, in Madrid, Spain. ↑ Howat, John K (1987). American Paradise: The World of the Hudson River School. New York: Metropolitan Museum of Art, Harry N. Abrams, Inc. pp. 3, 4. ↑ Kornhauser, Elizabeth Mankin; Ellis, Amy; Miesmer, Maureen (2003). Hudson River School: Masterworks from the Wadsworth Atheneum Museum of Art. Wadsworth Atheneum Museum of Art. p. vii. Retrieved June 26, 2016. ↑ "The Panoramic River: the Hudson and the Thames". Hudson River Museum. 2013. p. 188. ISBN 978-0-943651-43-9. Retrieved June 23, 2016. ↑ "The Hudson River School: Nationalism, Romanticism, and the Celebration of the American Landscape". Virginia Tech History Department. Retrieved June 26, 2016. 1 2 O'Toole, Judith H. (2005). Different Views in Hudson River School Painting. Columbia University Press. p. 11. ↑ Boyle, Alexander. "Thomas Cole (1801-1848) The Dawn of the Hudson River School". Hamilton Auction Galleries. Retrieved 19 December 2012. ↑ "Asher B. Durand". Smithsonian American Art Museum: Renwick Gallery. Smithsonian Museum. Retrieved June 26, 2016. ↑ "Walters Art Museum: The Catskills". The Walters Art Museum. Retrieved 19 December 2012. ↑ Avery, Kevin J. "Metropolitan Museum of Art: Frederick Edwin Church". Metropolitan Museum of Art. Retrieved 19 December 2012. ↑ "Corcoran Highlights: Niagara". Corcoran Museum of Art. Retrieved 19 December 2012. ↑ Potter, Russell A. "Review of 'The Voyage of the Icebergs: Frederic Edwin Church's Arctic Masterpiece'". Rhode Island College. Retrieved 19 December 2012. ↑ White, Mark Andrew (2002). Progress on the Land: Industry and the American Landscape Tradition. Oklahoma City, OK: Melton Art Reference Library. pp. 6–13. ISBN 0-9640163-1-1. ↑ Allaback, Sarah. "19th Century Painters: Hudson River School" (PDF). 2006. Hudson River Valley National Heritage Area. Retrieved 19 December 2012. ↑ Rickey, Frederick. "Robert W. Weir (1803-1889)". United States Military Academy. Retrieved 19 December 2012. Wilmerding, John. American Light: The Luminist Movement, 1850–1875: Paintings, Drawings, Photographs. National Gallery of Art, Washington, D.C., 1980. ISBN 9780064389402. OCLC 5706999. Wikimedia Commons has media related to Hudson River School.